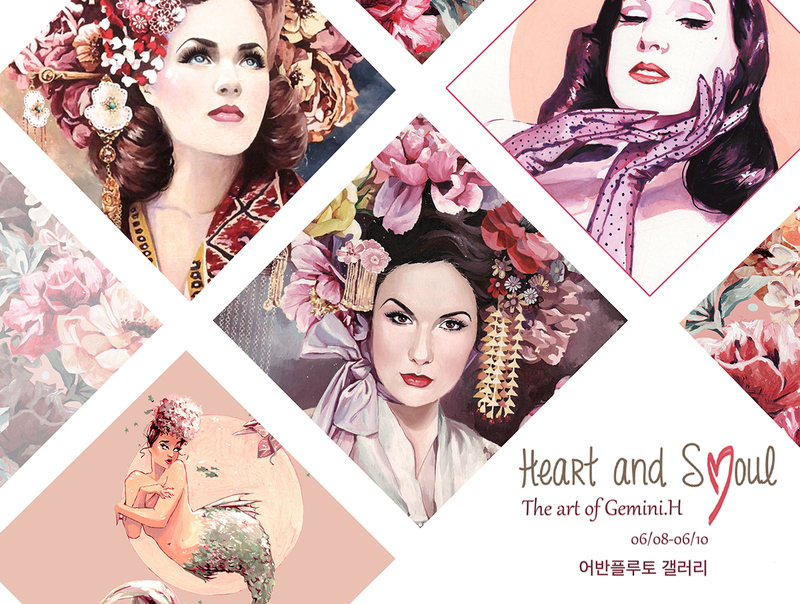 Gemini.H is a French self-taught artist who has been living in Korea for the last 5 years. She graduated in fashion design and her passion for art and history led her to start a career in illustration and fine art. Largely inspired by an art movement called “ART NOUVEAU” (popular between 1890-1910), this style can be found in paintings, fabric design, interior design, architecture. Gemini.H spent most of her life in the French countryside and likes to integrate floral ornaments in her work and experiment with different mediums and techniques just as “ART NOUVEAU” artists did in the past. Before going back to Europe, Gemini.H wanted to bring together and display the different works she has created during her time in Seoul in a last exhibition in Korea. The artworks will include paintings, illustrations, books, handmade crafts and accessories. The different portraits show women’s beauty regardless of the ethnicity or body shape, playing with traditional costumes inspired by European and Asian culture. The exhibition marks the end of her adventures in Korea but opens the door to new ones in her native land. Gemini. H는 독학으로 자신의 예술 영역을 발전시킨 프랑스 출신의 작가로 지난 5년 동안 한국에서 지내며 꾸준히 작업을 해왔다. 패션 디자인을 전공한 그녀는 예술과 역사에 대한 강한 열정을 가지고 일러스트레이션과 순수예술 분야에서 작가로서 활동하기 시작하였다. 1890년에서 1920년까지 페인팅, 패브릭, 인테리어, 건축 등 다양한 분야에서 강한 영향을 가졌던 예술 사조 ‘아르누보’에 크게 영향을 받고, 프랑스 전원 환경에서 어린 시절을 보낸 작가의 작품 속에서 다양한 꽃장식이 함께 어우러지는 것을 볼 수 있다. 또, 과거의 많은 아르누보 작가들처럼 작가 본인도 다양한 재료와 기법을 탐구하는 것을 즐긴다. 한국에서의 시간을 마치고 유럽으로 돌아가기 전, Gemini. H는 서울에서 살면서 작업했던 결과물들을 마지막 전시의 형태로 모아서 보여주고자 한다. 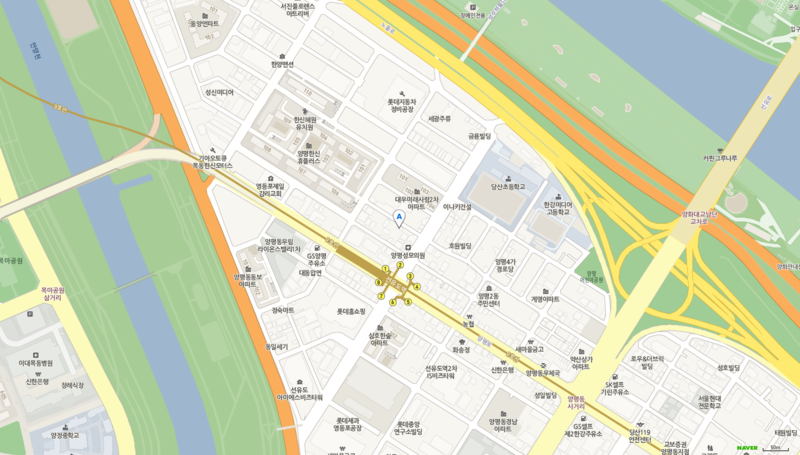 이번 전시에는 페인팅, 일러스트레이션, 그림책, 수공예품, 액세서리 등 다양한 형태의 작품들을 보일 예정이다. 다양한 초상화 작품들은 민족이나 체형과 관계없이 보이는 여성의 아름다움과 함께 유럽과 아시아 문화에서 영감을 받은 전통 의상의 우아함을 담고 있다. 이번 전시는 작가 Gemini. H가 한국에서 경험한 모험의 마지막을 기념하는 자리임과 동시에 곧 다가올 모국에서의 새로운 시작을 알리는 자리이다. Gemini. H는 독학으로 자신의 예술 영역을 발전시킨 프랑스 출신의 작가로 지난 5년 동안 한국에서 지내며 꾸준히 작업을 해왔다. 패션 디자인을 전공한 그녀는 예술과 역사에 대한 강한 열정을 가지고 일러스트레이션과 순수예술 분야에서 작가로서 활동하기 시작하였다. 어린시절을 보낸 프랑스 전원생활과 아르누보 예술사조에 강한 영향을 받은 작가의 작품 속에서 다양한 꽃 장식을 볼 수 있으며 회화 영역에서 넘어서 다양한 재료와 기법을 활용하는 모습을 찾을 수 있다.